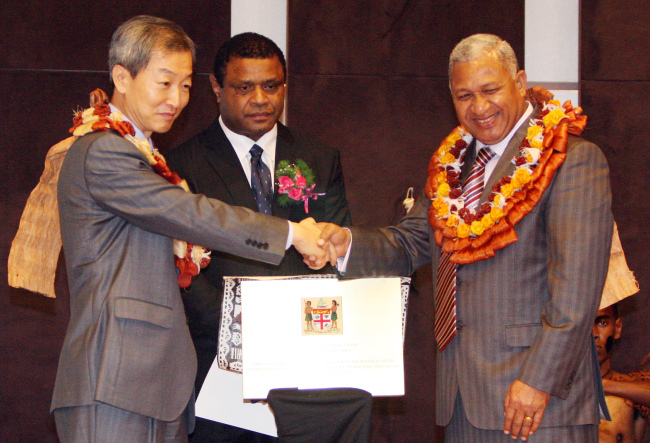 Fiji opened an embassy in Seoul on Thursday in the year of the 41st anniversary of diplomatic relations with Korea. The establishment of an embassy in Seoul will strengthen diplomatic relations and economic ties between the two countries, according to Fijian Ambassador Filimoni Kau. The move comes after Korea established an embassy on the island-group nation in 1980 while Fiji was represented by an embassy in Japan which also represented Fiji for Russia and the Philippines. Prime Minister Voreque Bainimarama attended the opening ceremony, while in Korea to visit the Yeosu Expo. “Our two nations have had a close relationship for more than four decades,” said Bainimarama during his opening remarks. “Fiji has benefitted greatly from technical and developmental assistance provided by the government of the Republic of Korea,” he said. The prime minister also noted the growing economic ties between the two countries, mentioning the 32 percent growth in bilateral trade between 2011 and the previous year. In 2011 Korea exported nearly $25 million in goods to Fiji, while importing over $20 million, while in 2010 and 2009 bilateral trade between the two nations amounted to $34 million and $22 million, respectively. As of June 2012 there are 82 Fijians currently residing in Korea, according to government data.